For anyone who enjoyed the series and wants a little bit of holiday nostalgia, this paint can is a terrific way to relive it all. For the formidable collector, it would be a welcome addition and a perfect holiday gift. As a parent, I can't imagine how you forget one of your kids, but, then again, as a parent frantically running around, I can. Every parent's nightmare is every kid's dream. 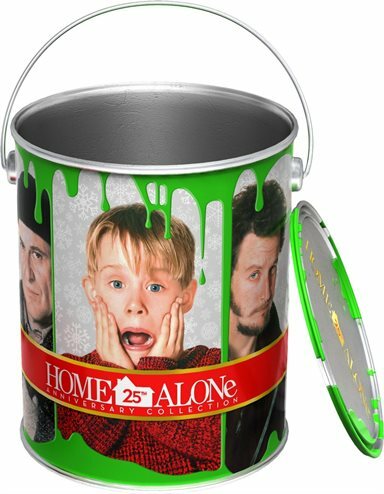 The scenario hilariously brought to life in the Home Alone series is coming back this holiday season, beautifully packaged in a decorative paint can. The McCallister Family is ready to take a Paris vacation for Christmas and all is well, until they realize they left little Kevin (Macaulay Culkin; My Girl) behind. Adding to the drama, robbers Harry (Joe Pesci; My Cousin Vinny) and Marv (Daniel Stern; Manhattan) plan to loot the family home fully expecting it to be vacant. When Kevin realizes what is going on, he foils their plans through a series of brilliantly laid traps. The other four movies follow similar plot lines, all with hijinx and foibles aplenty. Getting lost in New York, foiling a computer chip heist, and saving a royal family are the storylines of the sequels. Of course, not as good as the original the second offers some quality laughs but the latter films are a little lacking and far fetched. The special edition set includes all five movies on DVD, and the first two on Blu-ray as well, including extras and special features. There is also a collector's Christmas ornament, a funny plastic tarantula to scare family and friends, a wanted poster and Kevin's battle Plan. To top off the collection, it is all packaged in a very cute paint tin. The first Blu-ray offers several extras including a blooper reel, a "making of Home Alone" feature and the Mac cam, where 9 year old Macaulay Culkin was given a camcorder to shoot "behind the scenes" footage. Unfortunately, the extras, while numerous, aren't all that funny or interesting. They do however, take one back to 1992. While the first film is a classic, and Culkin is fantastic, the other movies in the series aren't nearly as strong. The further along you get, the dumber and more boring the series becomes. Frankly, they should have stopped after the first two, but for some unknown reason, they didn't. The final film never even made it to theaters, as it premiered on ABC Family. Download Home Alone Ultimate Collector's Edition from the iTunes Store in Digial HD. For more information about Home Alone visit the FlickDirect Movie Database.